It’s beginning to look a lot like Christmas and a better day to play slot online! It does not matter if it’s the holiday season or not, sometimes we all need a bit of Christmas spirit in our lives. The joy of everybody's slightly elevated moods, combined with the glistening lights and sparkly decorations that fester as far as the eye can see. 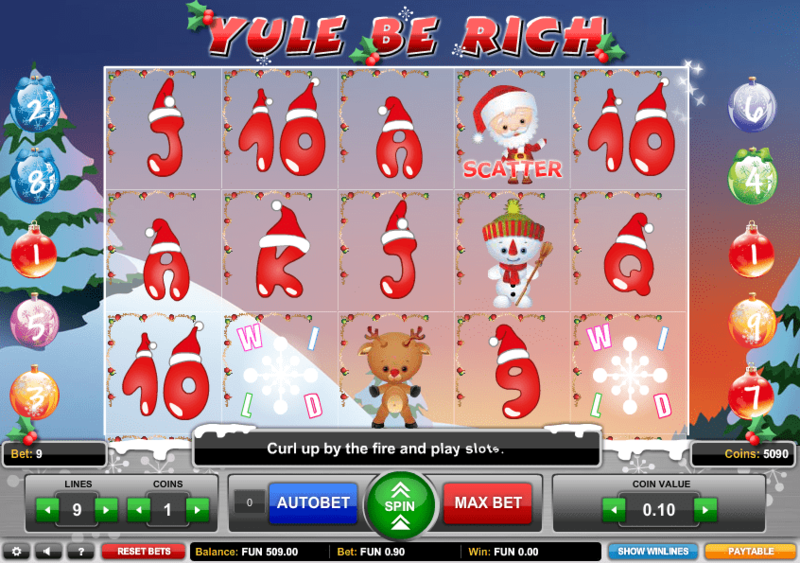 This Christmas themed online slot game is generous and there are some great winnings to be had through collecting the right festive symbols. Not only that, the bonus rounds are a lot of fun which include Santa Claus free spins to boost the chances of you increasing your winnings! There are many options for players who can set their own stakes, there are actually 315 ways of staking each spin so you won’t get sick of Christmas too fast with this online slot game! 1x2 are based in the United Kingdom and are becoming recognised for creating a variety of different themed online, 5 reel, slot games. Their themes are often creative and adventurous which give players a sense of escapism and the opportunity to have fun whilst spinning online. They also have a portfolio of other online casino games. In recent years, 1x2 gaming has made sure that their software is compatible with mobile devices so that players can enjoy their games wherever suits them best! Wizard can provide you with more superb games from this developer. The Christmas theme is projected from the start and the background shows mountains covered with bright white snow. Look out for Santa Claus flying his sleigh and team of reindeers dashing about the sky. Make sure to read more from our guide made for all players! The symbols include jolly snowmen, reindeers, fairies and stockings. The Wild symbol acts as a replacement for all other symbols apart from the scatters. 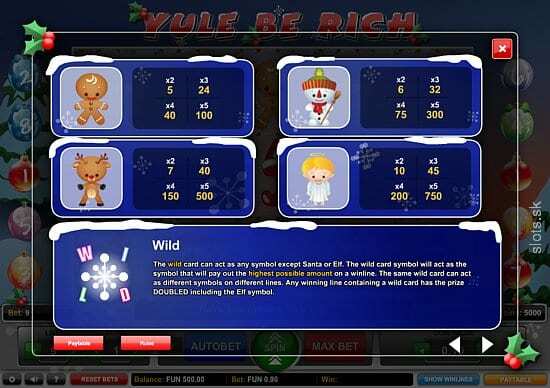 Santa will trigger free spin wilds (3 Santa’s = 5 free spins, 4 = 15 and 5 =25). Elf symbols will bring you free prizes as well – 2 elves will provide 10 x stake; 3 will provide 30 x. Then 4 equals 100x and 5 elves a remarkable 200 x your stake! Christmas Stockings – This bonus feature is the perfect Christmas bonus! Collect 3-5 matching stockings and increase your stake between 4 and 80 times your original bet! Santa’s Elves Snowmen – Uncover 5 of these snowmen to be rewarded with a prize up to 300 times your stake. Reindeers – 5 of these will earn players 500 times their stake! Fairies – These are the ones to get because 5 of these will pay out a very generous 750 times your stake – now that’s a Christmas worth remembering! This online slot game brings together all levels with the true spirit of Christmas in mind, there are some generous winnings to be had, with the bonus rounds having the potential to increase stakes and ultimately winnings! Players can set their stakes. Choose to play between 1-9 lines and each like can be stakes between 1-5 coins. Next, the value of each coin can be set between 0.01 and 0.5.to play from 1-9 lines, stake each line with 1-5 coins, and give each coin a value from 0.01 to 0.5. So a great Christmas will be had by all with Yule be Rich!